...As I Remember It...: Out With the Junk... LITERALLY! I'm tired of reading everyone else's epiphanies about 2009 and goals for 2010 so I will forego all of that. I was getting pretty tired of reading all the Happy New Year status updates on FaceBook and am quite happy that 2010 is finally here. Husband and I are getting ready to move into our apartment. We've been hangin' with husbands family for the past three months and "temperatures are rising", even in the midst of winter. Our super-healthy-eating got pushed to the back burner and I am so longing to be in my own kitchen again. I need to control what is stocked in our pantry, thus making it easier to control what goes in my belly. Seriously! I'm anxious and excited to have healthy fare again. My body can feel the difference. First on my agenda, after we move in, is to do a cleanse. There are several ways to achieve a cleanse. The most effective one for me has been Dr. Natura. Dr. Natura - This cleanse is assisted by psyllium husk drinks. It's like Metamucil on steroids. 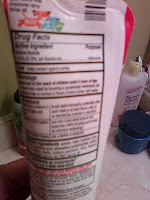 I have tried other brands of psyllium husk but it doesn't quite compare to Dr. Natura's concoction. Before you click on the link, I must warn you that it is VERY graphic. I purchased this product for the first time in November 2008. I was totally disbelieving the pictures on the website. Can I tell you that those pictures are absolutely REAL?! I experienced the SAME results! I even took pictures of it as proof but quickly deleted them because who cares about how excited I am about my own poo? This is not a total detoxification program. The basic program I got was a colon cleanse. Dr. Natura does offer detox products as well. I will be purchasing them this time around. This past August, I removed all the amalgamams from my mouth. These are the standard, silver fillings. These are filled with mercury and that is VERRRRRY bad for your health. They never tell you that when they're putting them in and more than likely parents have no idea how bad it is to the body. Anybody that took basic biology in high school can understand the osmosis process and how mercury can enter your blood stream. Totally different subject but definitely one of the reasons why I'll be doing a cleanse and a detox from Dr. Natura. Another bad thing about the dentist, I just have to get this in here, is their promotion of FLUORIDE. This DRUG FACT you see pictured here are required by the FDA. This means that there is something in the item that is harmful to the human body. You can find these warnings on many common, household items like peroxide, Nyquil, even anti-perspirant deodorant. Aluminum is added to an anti-perspirant to stop a natural process, perspiration. This process is essential to the body. Perspiration helps get rid of toxins and helps keep the body cool. Why would anyone, in their right mind, want to stop a function that God made? Also, aluminum enters your body by osmosis when you use anti-perspirants. We live in such a twisted world! (I soooo digressed) I want you to pay close attention to these labels. In fact, go check your toothpaste label right now and contact the Poison Control Center if you've ingested any of it. FLUORIDE IS BAD, BAD, BAD! I switched to an herbal toothpaste back in 2003 and have not had a cavity even though I tossed the fluoridated toothpaste out with the garbage. Anyway, this post is about the colon cleanse. Dr. Natura is my favorite. I highly suggest it if you're interested in cleaning out your colon. Good stuff.